Saw palmetto has a number of health benefits when taken as a dietary supplement. One of the conditions that can help with is prostate enlargement. It helps to improve symptoms like weak urine flow and frequent urination. Jamieson Prostease is a dietary supplement which contains saw palmetto and this review will be evaluating its effectiveness. The only active ingredient in this product is saw palmetto extract. Saw palmetto extract has an antiproliferative effect which means that it reduces how often the cells in the body divide. This is an important function in the prostate because excessive cell division is the major cause of the enlargement of the prostate. The cells mostly on the inner wall of the prostate divide more often than is necessary and this starts to expand the prostate. This process is known as hyperplasia. Saw palmetto extract therefore helps to reduce hyperplasia and prostate enlargement. While we believe this action is beneficial, saw palmetto extract should not be the only ingredient in a prostate supplement. 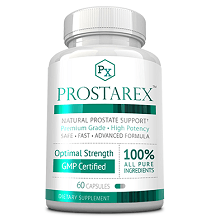 Other ingredients that should have been included are antioxidants (like lycopene- which has been scientifically proven to reduce the risk of developing prostate enlargement and prostate cancer) and vitamins and minerals to support the natural health and functioning of the prostate cells. One softgel capsule of Jamieson Prostease must be taken every day with a meal. Each capsule contains 125 mg of saw palmetto extract, which is about the same as taking 1000 mg of the raw herb. No major side effects have been reported with the use of saw palmetto in a dietary supplement. Customers who have long-term medical conditions and are taking chronic medication should consult a general practitioner before using this supplement. 60 capsules can be purchased online for the price of $29.99. This price does not include shipping or taxes and there are no bulk order discounts or subscription services available. This means that if the customer wants to use the product long term, they have to buy it every two months, at the same price. We could not find any evidence of a guarantee or returns policy for this manufacturer. This means that when customers purchase this product, they run the risk of it not working, and them being left frustrated and having wasted money. Jamieson Prostease includes a scientifically proven ingredient that is completely naturally derived. It is also offered at a reasonable price. The major problem with this product though is that it doesn’t contain more ingredients. The ingredient it does contain works, but it’s effect is not as strong, because it is not supported by other ingredients. This means that it is probably less effective than other prostate supplements. This is also a problem because the manufacturer doesn’t offer a guarantee. If customers then find the product to be ineffective, they will have wasted their money. A lack of the guarantee also shows that the manufacturer is not as confident in their product as they say they are, which is just further evidence to show that customers should look at product with more proven effectiveness.